Why not just buy REITs and forgeddaboutit? In “Historical Returns of the Market Portfolio,” issued last year, researchers Laurens Swinkels of Erasmus University, Rotterdam, Trevin Lam of Rabobank, and Ronald Doeswijk, looked at the performance of worldwide financial assets for the modern era, from 1960 to 2015. During that time real-estate investment companies and trusts have beaten inflation by an average of 6.43% a year, compared to 5.45% a year for global stocks. Over an investment period of, say, 20 years, that gap would be enough to raise your total returns by a third. Could you elaborate the title. I thought this was going to be about "REI, Recreational Equipment Inc", the outdoors/etc., supplier that is often mentioned here. Slip of the finger posted before title was complete -- fixed now. REITs tend to be a fairly divisive subject on the forum, perhaps a notch below the intensity level of the US-International debates. They don't seem to be getting much love especially as of late. You will also have people chime in to inform you that TSM funds already contain REITs. Also, there is no guarantee that past results will continue. Tech and health care have also done well over very long periods. Here's a chart, returns have been mixed, often lagging for very long periods. A REIT index fund is a diversifier for a US Total Stock Market index fund, not a replacement. I am guessing your question is rhetorical? The underlying volatility is very high - as evidenced by the Financial Crisis. REITs are almost by definition highly leveraged. A 100% REIT portfolio is going to have higher volatility than the S&P 500. And it's going to give an American a potentially big tax headache? The REIT structure only emerged in the US in the 1970s I believe (it was a way of banks getting repossessed real estate off their balance sheets, as I recall, after a property crash in the 1970s). It's even newer in most other countries (perhaps not in Australia). So it was a tiny sector and doubtless mispriced in the early years. It's like comparing the performance of internet stocks now to internet stocks in 1995 (the year of the Netscape IPO, from memory). REOCs are companies, straight up. So it's not clear that they should have different characteristics than stocks as a whole, other than being in a particular sector. Yes during 2008 the correlation went to 1, but that is to be expected as that crisis had its roots in real estate. Most market crashes are not instigated by real estate. During the dotcom crash REITs did serve as a great hedge. My question is, should the average homeowner be increasing his exposure to real estate by holding REITs? If we extend the times from 1996 (when Vanguard's fund was launched) to today, REITs have outperformed both 100% TSM and a 60/40 portfolio. 23 years of underperformance is a long time. Imagine the arguments if international underperformed for that long. There's no denying the data that shows REITS have performed well. However, it comes at the cost of a lot more volatility. Over the last twenty-four years (the time period during which Portfolio Visualizer has data for REITS), a portfolio of 100% REITS had a standard deviation of 19% versus 15% for 100% US stocks and 9% for a 60/40 portfolio. Considering risk-adjusted returns, the REIT portfolio performed the worst of the three, with a Sharpe ratio of 0.44 versus 0.55 for 100% US stocks and 0.68 for the 60/40. You need to look at max drawdown. Indeed, it is pretty gruesome, and is another facet of the higher volatility. I think I’ll pass. I don’t have the stomach for it. The underlying trend in the data has an impact, though. Look at the REITs - they move from undervaluation to (maybe) fair valuation. Actually I was going to say the majority of crashes have their roots in leverage. That's what turns ordinary asset price volatility into an effect on real economic variables. Thinking Slater-Walker and the 1973-74 crash for example (UK Secondary Banking Crash). There actually *was* a lot of leverage in the dot com crash - there was something like $2 trillion of telco related debt out there and a lot of it became impaired. Also there was vendor finance and that really hit a lot of the big equipment manufacturers. I could also mention the New England property crash + the S&Ls in 1989-90. But there was another US CRE crash in 1980 I think. CRE seems to be on a 14 year cycle +/- 5 years -- I am sure that's been studied. Because of the centrality of banks in commercial property lending, there's a straight macro channel via the destruction of financial intermediaries. So called "D & C" loans (Develop & Construct?) were significant on the balance sheets of regional US lenders in the Crash (see Calculated Risk blog posts around that time). It may be the securitization of commercial mortgage debt, plus the growth of REITs, has made the industry less cyclical by increasing transparency and speed of market reaction. Maybe . Vanguard has a paper on that. If we are talking US REITs and a US homeowner, there's enough correlation to make one chary of that bet. Part of the underlying correlation is that both have a performance related to changes in interest rates, as well as the general economy, which itself is GDP-related. If you read the John Sterman book on Systems Dynamics Modelling, there's a nice little piece in there on real estate crashes and how they happen. Commercial real estate bubbles and crashes. That seems to be an innate property of the CRE market, arising from time lags in construction (supply-demand being perpectually out of balance) and forecasting errors. When you add financial leverage (Other Peoples Money) to that it makes the cycles even more volatile. Again (Donella Meadows book is a good introduction) those are what causes industry to boom & bust. If you did an MBA you undoubtedly did "the Beer Game" as a class exercise? That's your classic boom-bust cycle. Also if you used the People's Express Airline simulator. Last edited by Valuethinker on Fri Nov 02, 2018 6:23 am, edited 2 times in total. Yeah they were hit with a double whammy. Falling asset prices (the real estate they owned) and surging debt costs- they borrowed short term and were faced with refinancing during the credit crisis. Down 21% in 2007 and 51% in 2008. I limit reits to 10% of my risk portfolio with another 10% in tiaa direct real estate. There was a lot of fear that many reits would go bust. That being said I still invest in reits but limit to 10%!of my risk portfolio. Drawdowns are a tricky thing to think about. Yes, REITs had a bigger drawdown. But also note that at no point was a portfolio of REITs at a lower dollar figure than the comparison portfolios. They "fell from a higher height". Would you rather have a $1000 that falls 60% or $500 that falls 20%? There's no right answer. Some people have strong loss aversion. Some care more about absolute returns ("you can't eat risk-adjusted returns"). It does seem, though, that most people focus on the loss they are currently suffering than the gaind they made in the past. REITs represent commercial real estate and crashed in late 2008. The crisis in "real estate" occurred in residential real estate in 2006. Please connect the dots for me. I always thought it was a "subprime loan crisis," not a "real estate crisis" as such. As far as I remember, and I wasn't watching any of this carefully and haven't researched it since, the crisis in "real estate" involved bad loans made to residential homeowners. It wasn't a "real estate crisis," it was a "subprime loan crisis," caused by issuing mortgages in huge numbers to people who weren't remotely capable of making their payments--in many cases without any documentation at all. This was combined with some phony financial engineering, that deceived financial people on a large scale into believing a high-grade CDO silk purse could be made from a diversified, supposedly uncorrelated portfolio of low-grade mortgage sows' ears. It was made worse by believing that there was good money to be made in credit default swaps due to their supposedly low risk. So, connect the dots for me. Were subprime loans also being made in commercial real estate? How did a residential real estate crisis based on subprime loans to individual homeowners spread into commercial real estate? Did REITs stop paying out their dividends in 2006? If a crisis in REITS caused the general crash of the stock market, why was the crash in REITs simultaneous with the general stock market crash (actually lagging it by a couple of weeks), instead of visibly leading it? You should google how CMBS performed relative to RMBS during the crisis. In short, it was a leverage crisis across all forms of real estate. Drawdowns are a tricky thing to think about. Yes, REITs had a bigger drawdown. But also note that at no point was a portfolio of REITs at a lower dollar figure than the comparison portfolios. Didn't it go lower dollar-wise in February 2009? It seems so from the chart. Indeed you are correct and I was wrong. Perhaps I looked at the wrong Portfolio Vosualoser chart. Or I just need glasses. I was writing about REOCs - Real Estate Operating Companies. REOCs are not REITs. It's an obvious point, perhaps, but it's all in line with Hyman Minsky. 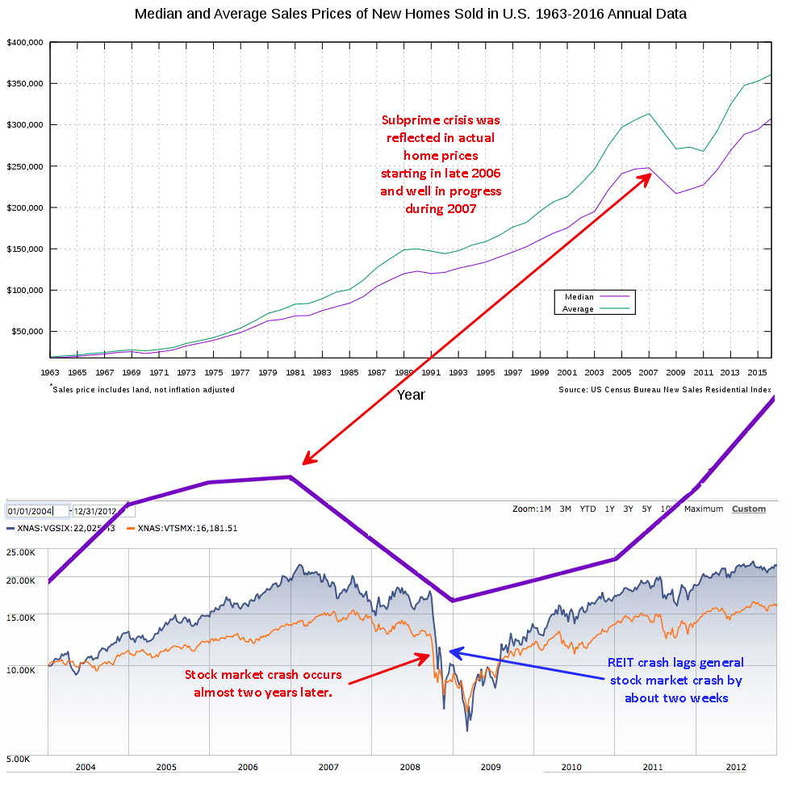 Bubbles and busts are caused by the accumulation of private sector leverage, and that almost inevitably has a real estate angle - because you borrow money against assets (an asset value is just a crystalization of expected cash flows) and so you leverage your real estate holdings. 1990 in New England was both a residential and a commercial housing crash. So was the S&L bust in the south west (although the secular economic trend was about falling oil prices and (in California) cuts in defence spending). 1980-81 everyone who had leverage (that was not at long term fixed rate) was getting pounded. 1973-74 there were definitely problems in Commercial Real Estate. There's a book "Form Follows Finance" that the height of new skyscrapers nicely tracks the economic cycle -- after the peak. So the Empire State Building opened during the Great Depression, and was not filled until the beginning of WW2. The World Trade Center opened in 1972, right when NYC was entering a bad property recession ("Ford to New York: Drop Dead"). The Petronas Towers in Kuala Lumpur opened just at the time of the 1997 Asia crisis. The Biraj in Dubai just when the 2008 Crash hit. etc. Commercial real estate properties like those held by REITs are funded in part by large-scale borrowing from banks and insurance companies. In the lead-up to the financial crisis, there was also an active market for commercial mortgage-backed securities, which largely dried up as a source of financing by early 2009. The availability of credit from banks was generally adversely affected by the crisis, as well. These developments wouldn’t have to adversely affect any particular property right away unless it needed to access the credit markets at that moment - for example, to refinance existing debt. But some of the same factors that affected stock markets in this period would have affected real estate markets, as well: lack of liquidity on the part of buyers, need for liquidity on the part of sellers, a general aversion to taking on investment risk in light of the heightened level of uncertainty, as well as a serious deterioration in the real economy that would hurt the operating performance of real estate just as it would hurt the operating performance of companies in other industries. Given that constellation of factors, it’s not surprising that REITs went down in value during the financial crisis. These developments wouldn’t have to adversely affect any particular property right away unless it needed to access the credit markets at that moment - for example, to refinance existing debt. - commercial mortgages often come with covenants, which are periodically tested. The killer is Loan-To-Value, typically 80% for senior real estate lending, I believe. Once the value falls, the LTV drops below 80% and then the covenant is breached. What I think happened is that as part of the bank bailouts, the banks were encouraged not to call the loans and realize losses on them (at least at first). Instead they went into "forbearance" i.e. interest only. The rally in commercial property prices over the next 3-4 years as interest rates fell and thus yields fell (cap rates) and values rose made it possible to realize the properties at prices that paid off the loans. There were some horrors though. After Equity Office Properties was taken private by Blackstone, they sold off something like $7 bn in Manhattan office properties to the Macklin family, who put up all of $250m in equity, the rest borrowed (numbers are approximate). Needless to say, when the crash hit, the banks got stuck with the buildings . What I am not clear is what happened with all the CMBS. There was a lot of talk (and some pretty frightening power points) about a "refinancing wave" - ie that CMBS have to be refinanced typically every 5-10 years (the term of commercial mortgages). I am not really sure what happened, other than that property prices recovered relatively swiftly. The overbuilding of previous property crashes was not much in evidence at least until the severity of the recession really took hold. But some of the same factors that affected stock markets in this period would have affected real estate markets, as well: lack of liquidity on the part of buyers, need for liquidity on the part of sellers, a general aversion to taking on investment risk in light of the heightened level of uncertainty, as well as a serious deterioration in the real economy that would hurt the operating performance of real estate just as it would hurt the operating performance of companies in other industries. - demand for real estate is closely correlated with the economic cycle. If GDP goes down, demand for commercial space goes down - stores shut, companies cut staff/ economize on premises/ go bankrupt. Further supply keeps increasing for a while as buildings already started are finished. An exception is apartment buildings. Traditionally they are resistant to recession - demand may even go up as those who previously bought a home stay in rented accomodation/ are forced back into rental. However unemployment also cuts rental demand, and I think this time things got so bad that it hit that sub sector, too. Risk is proportional to potential reward. There are very few absolute truths in the universe, but that one comes about as close as any. And not just for investing either. If you stay 100% I would guess that there is a better chance that you will be much richer than me in 10 or 30 or 50 years. There is also a better chance that I will be solvent and you will be broke (assuming no other source of income to compensate). The same is true of REITs vs equities. In fact, if you go 150% stocks you might outperform REIT's. I imagine you would. Even more if you go 200%/ So using your argument, why not buy stocks on margin instead of REITs? Do you see the logic here? REITs are riskier than stocks, which accounts for their overperformance. And another point....if you own your home, it is a non-diversified real estate asset. If you have significant equity in your home it is likely a significant part of your overall "portfolio". If you invest 100% in real estate on top of that, you have no protection if real estate crashes. On the other hand, if you win the lottery you might become a billionaire.